This fall I have been working on the second styling of a very large tree. In fact, it’s the tallest and widest tree I own. It is definitely the hardest to move and is too tall to fit in the back of Lee Cheatle’s van. So, it’s been quite a daunting project to undertake. Way back in 2004, I had the privilege of spending a day in the wild with a few BSOP members, including the world’s foremost yamadori collector, our own Randy Knight. I now know the year, after miraculously finding a photo of the tree. Matt Reel (before he left for Japan) was with us, along with Lee. After a while of scrambling, we spotted this tree and Randy helped me pry it from its rocky perch. It had probably been there a couple of hundred years, growing ever so slowly. Somehow, we got enough roots for the tree to survive and I planted it in a box for several years and then into a bonsai pot. An impossibly large bonsai pot. It’s all I can do to move it from a bench to a cart, let alone carry it. In 2014, ten long years after it’s collection, I finally styled the tree with help from Ryan Neil in his Elongating Species course. The tree was fifty inches tall, and had branches and trunks going everywhere. A few branches in the extremities had died over the years, but everything was pretty much intact with lots of branches to work with. I obviously had been looking at the tree’s possibilities for a long time and knew that Ryan had something in mind for it. I kept trying to figure out where I could shorten it to make a new top, plus dealing with the branches popping out from the sides that were starting to make their own trunks. How was I going to lower those branches and orient them correctly? Then Ryan started in on me, encouraging me to look at it a different way. I started cleaning the tree but wasn’t totally convinced. I heard a voice inside me say, that’s not really how we do it in bonsai. I try to be open to new things, but this is kind of crazy. But as our conversation turned from minutes to hours, I finally had a moment where the light turned on I blurted out to Ryan, Got it! I have been to that place. I grew up there. My job now is to use this bonsai to take you there. I had let my well-developed ideas of bonsai norms occlude my own personal experiences. I grew up a rather privileged life. That is to say that I grew up here in the Northwest, on the east side of Portland, the gateway to Mount Hood. I was a Boy Scout with plenty of backpacking in the cascades on the weekends. I climbed Hood twice, and Mount Adams once, spending the night on the mountain itself. My cousin and I bushwhacked the wilds of the Wallowas one summer. My dad and I bowhunted for deer in the high hills opposite of Mount Hood. There is virtually no area that I have not been to at some time or another from Hood River to the Santiam Pass. The mountains were my playground, and usually somewhere near timberline. As Ryan continued describing this form of alpine tree, I recognized it as what we call Krummholz. It’s a German term meaning “twisted wood”, which describes the trees surviving at the timberline level – where just a few eke out an existence and are constrained to bow, literally, to the forces of natures. The wind and snow drive them to a spreading structure with multiple trunks and ground hugging forms. In leeward pockets, the trunks can extend a bit higher until sheared by hostile winds. This is the place that I want to take you. That is what the best bonsai do. They take you to a place, a memory, a feeling. And finally, I had that vision in my mind, the tree that I wanted to create. Fast forward to 2017. The wire had been on the tree too long, at least in some places. I had already removed some portions as they cut in, but this last year, the tree really took off and almost doubled it’s foliage. Time to rework. I removed the wire in September so that it could recover and start to heal any damage during the fall. It started to bleed some sap from the deeper scars, but not too bad. I began to re-evaluate the design, making some tweaks here and there as I wired. This beast has seven apices. Yes. Seven. Just like the like the seven-headed beast in the book of Revelation. The main branch starts to cascade and then turns towards the sky to create one of those apices, so it’s pretty crazy stuff. And now, it’s even budding back on the hundred-plus year old trunk to create new branches. It was about then that I had the really big “Aha” moment. After more than 25 years of working with bonsai, I realized that this single tree represented my home waters. That’s the term fishermen use to refer to their local, favorite fishing hole, whether it be a river, stream or lake. The place they go to again and again for a good time and great adventure. It was then that I realized that this tree had been with me during nearly all of the great outdoor adventures of my youth. The Subalpine Fir, Abies lasiocarpa. It’s definitely one of the least used native trees for bonsai, but it was everywhere that I went as a youth. The memories started to flood into my mind, taking me to places that had long since grown cobwebs. This tree was there at the timberline when I climbed mountains. It was there while hunting as we crawled through the thickets of the trees that were almost impenetrable. They were there beside the dusty paths as I tramped along the Pacific Crest Trail. Unlike the lofty and much more common Douglas Fir, this was the tree that I could reach out, touch, and brush my pack against. In high school, I learned to paint watercolor landscapes. Mountains were my favorite subjects, along with a few extra brush strokes, the trees at timberline. I have been drawing those trees ever since, and now make a living drawing at times, you guessed it, Subalpine Firs. 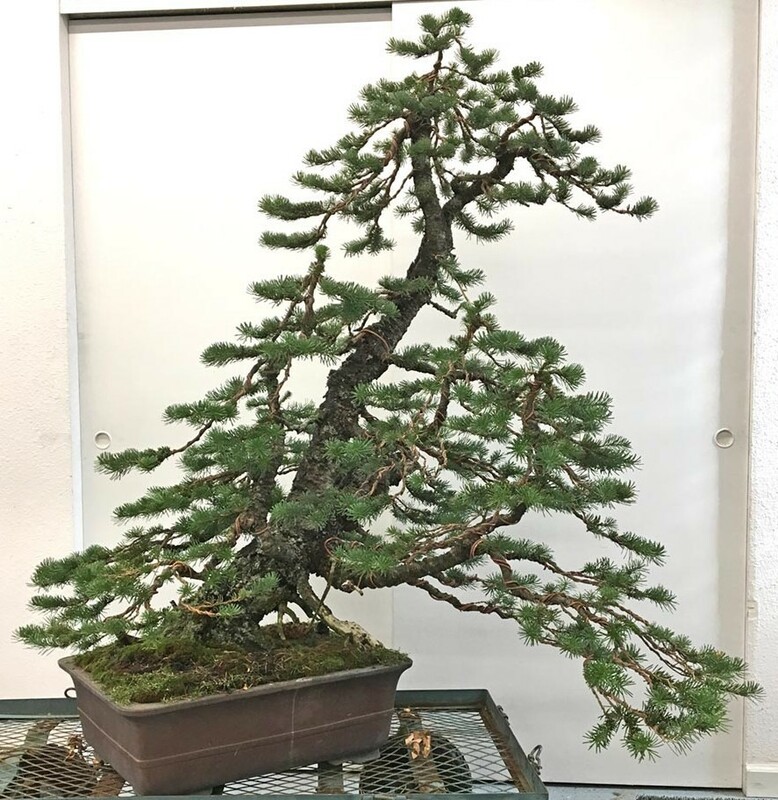 So here is this bonsai, which I have had on my bench for so long and didn’t recognize the significance that it held for my life. It is the one bonsai that can truly meld my love of the outdoors with my passion for creating. It now has the highest of honor in the garden and may be my best contribution to the bonsai world. It certainly has a ways to develop, and I have to find/make/ design a new container for it. The jury is still out on that one, because it also has to be a part of that place that I am sculpting. I have included a few photos. I somehow managed to take a photo of the tree before it was removed from the mountains. The large tree, just behind it, makes it more difficult to see. There is a photo after this year’s styling. I really need to go back and reset the branches, especially with info from the photos. After next years Spring growth, I will be able to reduce the length and compact some branches. I didn’t want to push it too much this year. And finally a photo of myself, about 15 or 16, in the Jefferson Wilderness with Subalpines in the background. I wanted to share this tree’s story and the connection that I have with it to encourage you to find the same. That’s why I do bonsai – to connect with my environment, my past, and my future through art. You may not have the kind of life experiences that I have to draw upon, but of course, you have your own, and I can’t wait to hear them.